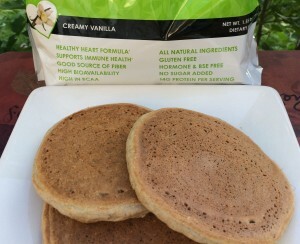 Amount Per Serving – 2.5 pancakes! Have you ever known pancakes to contain anything other than CARBS! Well – these are game changer pancakes! Not just for their high protein but for taste! Pancakes like this could easily be served up at a 5 star resort or a renowned spa! Not only are they luscious and light, but at the same time they contain a healthy amount of protein! Protein is a powerful way to fuel up after a long night’s rest. I always start my day with protein because I feel more energized and stay full longer. Since I’m satisfied and full longer, I don’t over-snack. And – I don’t even eat a half portion since they are so filling! I am totally fine with 2 pancakes so I give my hubby 3. Now we’re both happy! High-fiber meal (can help you lose weight and reduce your risk for heart disease, stroke, and type 2 diabetes). Low in saturated fats which accounts for only 4.4% of calories – well below the 9% limit! Add egg, oil and milk of choice. Mix well. Allow to stand for 5 minutes. Measure 1/4 cup batter for each pancake. Cook on one side until bubbles form on the edges. Turn and cook on other side. For thinner pancakes, use a little more milk. I am so excited about the It Works! protein powder. It’s SUPERB in smoothies too! If you have ever been to a conference and tasted the creamy deliciousness of the vendor smoothies – well – the It Works! protein powders taste just like that! I have been a smoothie lover for years, having experimented with all types of brands. The It Works! Brand is not only the most delicious but I love the superfood nutrition. Their proprietary blend contains a superior blend of protein, as well as feel good and mood-elevating superfoods and soluble and insoluble fibers. Some of my favorite power foods are the maca and cacao powders, blueberry extract and yes – there are even cruciferous extracts (broccoli) – you would never know so much nutrition is packed into this powder! BTW…Be careful what you put on the top of these pancakes. Syrup is loaded with sugar! Just 1 Tablespoon of maple syrup has 52 calories and 13 carbs! Try adding a 1/2 Tablespoon of maple syrup or regular syrup but dilute it with water. However, if you’re like me and want a lot of thick pouring syrup with NO calories, get this delicious syrup from Walden Farms – it’s our favorite! Stay tuned for my next recipe using the It Works! Greens in my Carblightliving Power Packed Green Smoothie! HOW TO ORDER THE CREAMY VANILLA ULTIMATE PROFIT®! There are 2 ways to order the CREAMY VANILLA ULTIMATE PROFIT® – or any of the company’s other high quality It Works! Products: BE SURE TO GIVE MY IDENTIFIER NUMBER SO YOUR EMAIL IS PROVIDED TO ME. 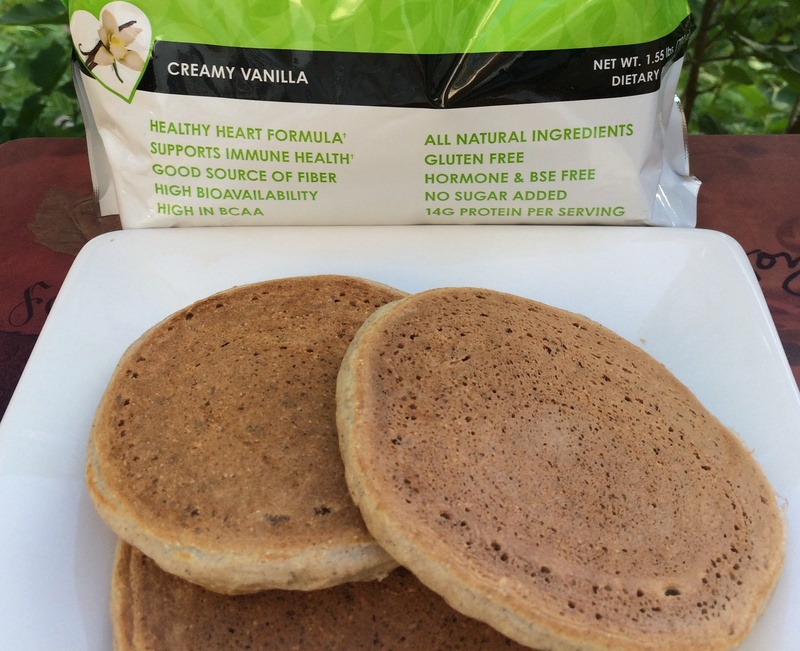 That way, I can send you my newest recipes using the vanilla and chocolate protein powders as well as their other nutritional products, and also be entered into drawings for FREE product giveaways, product credit – and much more! ONLINE: Use my ID# 5790557 and order online at my It Works! Website: jmercer.myitworks.com. When you sign up for 3 months as a LOYAL CUSTOMER you can get the 30 serving package of CREAMY VANILLA ULTIMATE PROFIT® at 40% off or $69 and also get FREE shipping after 3 months! OR you can order it as a RETAIL customer for $115 without signing up for the 3 month minimum. Use my ID# 5790557 and order online at my It Works! website: jmercer.myitworks.com. Email me at jmercer@carblightliving.com with any questions.